GIBS offers post-graduate academic, senior executive, short course and extended programmes specialising in the various aspects of general management. The programme is designed to meet the needs of the mature, self-motivated scholar. It provides a blend of individual and peer interactive learning challenges that stretch and test potential. As an outcome, the successful learner should be equipped to create scientifically grounded knowledge and contribute to positive business results through intellectual leadership. ​No two individuals are the same. At GIBS, we understand that everyone is different. That's why we've created an MBA as unique as you are. With GIBS, you get to choose exactly how your MBA will work for you. With the widest choice of electives and global experiences you can customise your MBA to suit you. Dynamic, challenging, interactive and inspiring, it's aimed at developing well-rounded and effective managers and human beings who are committed to choosing their own path. The part-time PDBA is aimed at fast-tracking high-potential individuals in the early stages of their management careers into the world of business. It will help you gain the business knowledge you require to lead and thrive in today’s competitive environment, paving the way to future career success. The PMD will enhance your career by developing your business knowledge and improving your management skills. You will gain a clear understanding of a number of key management functions and an overall perspective on what it takes to run a successful business. The full-time PDBA is designed for recent graduates to develop business knowledge and acumen, in order to accelerate their access to the workplace. This practical course includes an internship as well as a consulting project with a real business that will pose a business problem that you are expected to find solutions to. This Master's degree in International Business will enable you to transform from a traditional business manager into a global business leader who understands the complexities of managing in a global society. The Masters in Corporate Strategy will give you leading edge knowledge to help you gain a deep understanding on how organisations need to react timeously to rapidly changing business environments, digital disruption and fast changing business models. This Master’s programme will be a combination of courses followed by a research project. You will be enraptured by the latest research on interesting topics such as strategic management and strategic leadership. At the same time, you will have developed insights that will make you a more effective leader at a senior and executive level. 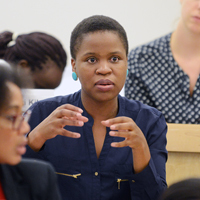 A Harvard programme run in partnership with GIBS. Designed to strengthen your leadership skills and build your insight into local, regional, and global markets, the programme explores the proven approaches of successful leaders in Africa and around the globe. A programme for senior managers who are transitioning, or have transitioned, into a general management role. Through lectures, simulations, company visits, an international immersion, coaching and 360 degree assessments, you will grow in knowledge, experience and confidence. With an experiential learning immersion and international travel that takes you to Silicon Valley, the home of many global technology companies and start-ups, this programme will equip you with the insights and skills needed to design and support your organisation’s technology strategy. This programme is aimed at those wanting to make a difference and is designed to blend world-class business expertise with the complexities of social change. It is aimed at leaders who are looking for the skills, tools and resources needed to build and run an effective social enterprise. A forum in which grade 11 learners critically engage on relevant issues so that they may better define and actuate the South Africa in which they would like to live. Learners are selected on the criteria that each has distinguished themselves as a leader in their school community. An award winning leadership programme that supports leaders in business, civic society and government to understand and navigate the complexities of the South African context and to impact positively on the pressing challenges that face us as communities, as organisations, and as a country. This programme is for women who are ready to undertake a significant process to improve their efficacy as authentic and effective leaders. The focus is on the development of practical tools that delegates can apply in real-time and with the support of a tailored peer group and certified executive coach. The GEDP is a high-level leadership and general management programme for senior executives. It will allow you to amplify your exclusive leadership style and future-proof your abilities so that you are equipped to compete as a professional anywhere in the world.